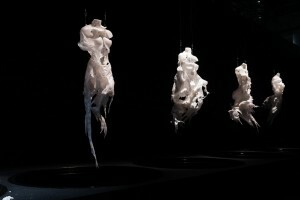 In ‘Dream Out Loud’ in Stedelijk Museum Amsterdam Bart Hess exhibited a range of wax molds, looking like dresses, that were made around a female model titled ‘Digital Artifacts’. 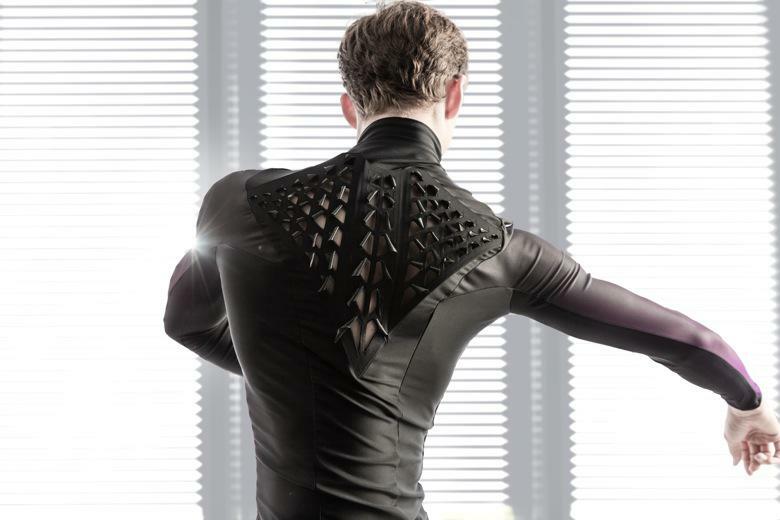 His concept being that everyone can print their own reusable ‘second skin’, a garment fitted exactly to an individual body. If everyone would be able to print their own so called ‘personal uniform’ (a set of clothing that is to be worn daily) it would result in a decrease of the production process of garments in countries like China and Bangladesh, “saving” the people involved from their horrible working conditions. The problem here is that, for one, not many people own a 3D printer and that, in this time of resource scarceness, virgin material would still need to be used (for the making of 3D printers and for new printing material). 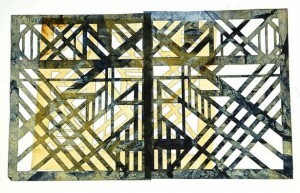 For an interview with Bart Hess about other works click here. ‘Digital Artifacts’ by Bart Hess for the ‘Dream Out Loud’ exhibition in het Stedelijk Museum Amsterdam. Although Bart Hess’ idea of the personal uniform is durable, the (re)printing of it is not. As a more eco-friendly alternative, new developments are arising in the world of textiles; bacterial fabric, which enables us to grow clothing from bacteria and fungi. Another name for it, founded by Sacha Laurin, is ‘Kombucha Couture‘, referring to the Kombucha fermented green tea that is used in the process. Kombucha mixed with sugar and SCOBY (Symbiotic Colony Of Bacteria and Yeast), left inside a container in a warm, dark room will feed the yeast and bacteria. This can be done by anyone from home (see the previous link). These will grow threads of cellulose, which will layer and eventually form a watery consistency which then needs to be dried out. What is left in the end is a fabric like structure and that can be sown into garments and jewellery. 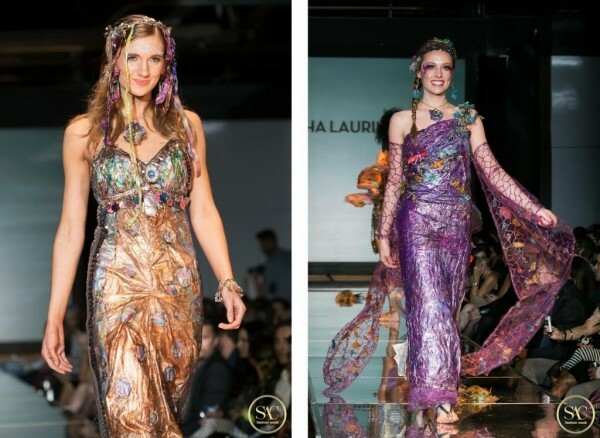 As shown below Sacha Laurin has mastered the element, making beautifully coloured, natural and durable garments. 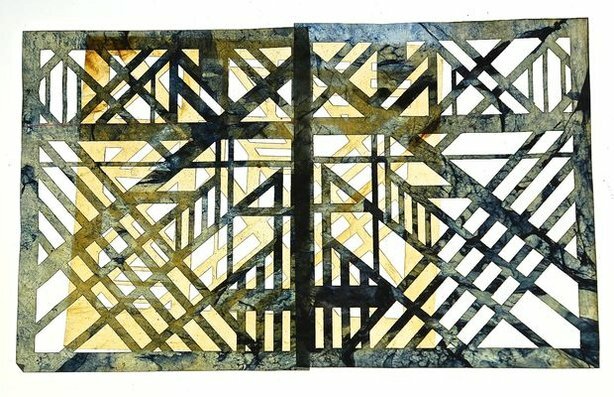 For more information on biomaterial and a done home experiment see Jana’s blogpost titled Material Alchemy. 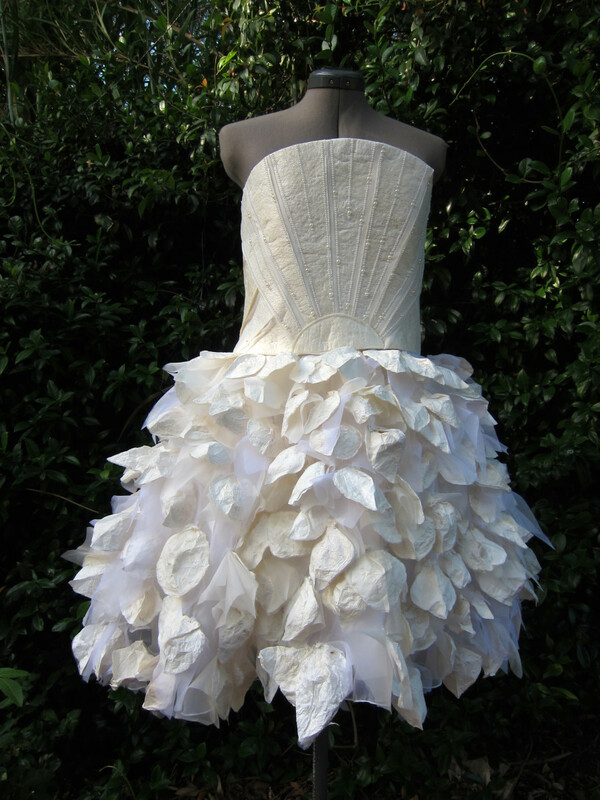 Pieces of ‘Kombucha Couture’ by Sacha Laurin. Suzanne Lee of BioCouture is another fashion designer who is working with bacterial fabrics. In various TED-talks she she explains her process and further developments she has made regarding the colouring of the fabric. She for instance found out that due to the matter’s high level of water absorbancy the bacterial fabric does not need more than one dip in indigo to make it blue, whereas cotton needs several, making it much more durable. It can also be coloured with natural materials such fruit and vegetable pulp, turmeric and others like metal (which will turn it black). 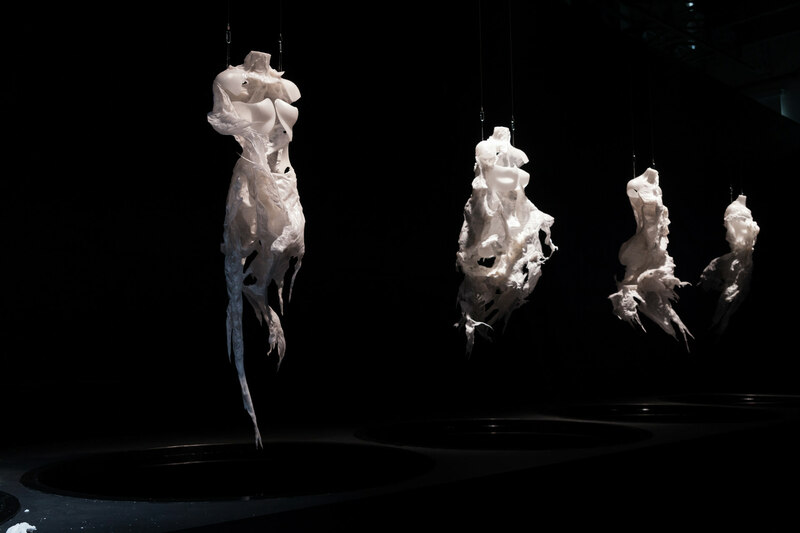 Another thing is that if the fabric is placed around an object or body while it is still wet it will dry conform to the corresponding forms and shapes, creating a second skin. Left: Growth of cellulose with Kombucha. Right: Wet Kombucha cellulose left to dry. Left: Suzanne Lee draping the wet Kombucha cellulose onto a mannequin. 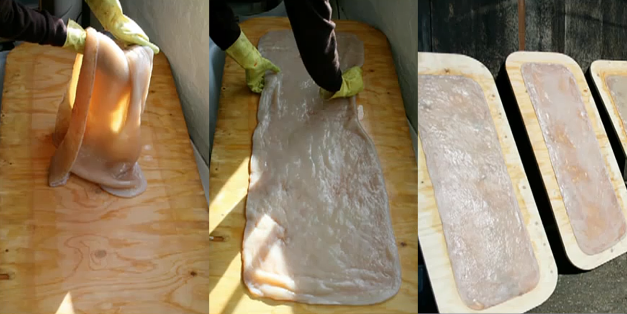 Right: The dried garment made out of bacterial cellulose. 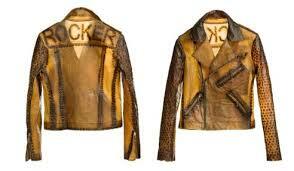 Biker jacket made out of Kombucha fabric and iron nails, which turns the material black naturally. Another way of using microbes to create fabric-like materials is the process of fermentation. This process is found in the making of wine and beer and it can be used to make biofabrics by letting the microbes grow a layer of cellulose on top of the wine or beer. This is part of the research that is being done for the ‘Bioalloy‘ project by of the University of Western Australia since 2005 until today. 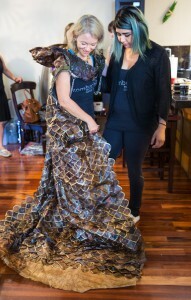 Fermented dresses made out of beer (left); “The Beer Dress”, and wine (middle and right); “Micro’be“ by Donna Franklin and Gary Cass for Bioalloy. 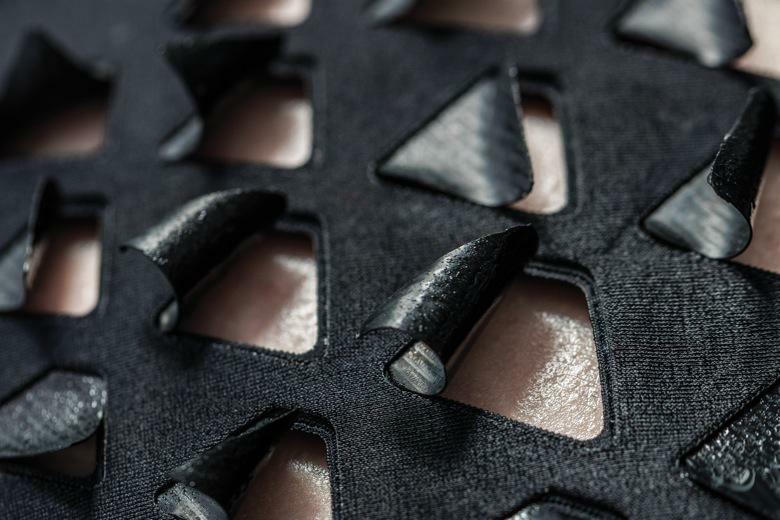 The problem Bart Hess encountered in his search for a second skin can be solved with bio fabric. His problem being that none of the materials he tried (such as wax, latex and foam) would let the skin breathe enough for it to be bearable to wear for a long time. Coming from a breathing organism itself the bacterial fabric will let the skin breathe and will act in a more similar way than plastics and other synthetic materials will. This fact brings it closer to being a second skin. Besides, everyone growing their own clothes would be much more environmentally friendly than everyone printing their own clothes, which would mean that everyone would have to own a 3D printer. Firstly, because bacterial fabric is biodegradable waste material made by bacteria/fungi whereas plastics are not biodegradable. Secondly, because the 3D-printing would require the use of new materials and electricity, which bacterial fabric does not necessarily. However, a big problem with bacterial fabric is that it is highly water absorbent. Once it comes in contact with rain or sweat the fabric will start to swell, making it unpleasantly slimy to carry on your body. 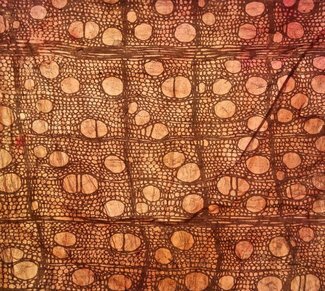 More and more research is being done on the front of bacterial/fungal fabrics, by Stichting Mediamatic in Amsterdam for example (you can read their articles on fermented fashion and bio-couture). They have an aim to find consistencies that would be usable as textiles for fashion, it should not be too difficult or time-consuming to find a way to make bacterial fabric water resistant and/or repellent. All the research being done also means that the concept of everyone growing their own clothes is realizable in the not so distant future. Patterns made out of Kombucha fabric. A different development by MIT (Massachusetts Institute of Technology) is the adaption of a Japanese cooking bacteria, the so called Baccilus Subtilis, to react in size to moisture and humidity levels. When they are sown into garments and strategically placed on the body in flaps they will open and close depending on the heat and amount of sweat the body radiates, allowing the skin to ventilate. This development comes one step closer to finding the second skin (and the personal uniform) that Bart Hess is looking for. It could provide us all with a personal uniform, starting a movement of slow fashion and fighting crises such as overproduction, environmental waste and resource scarceness. 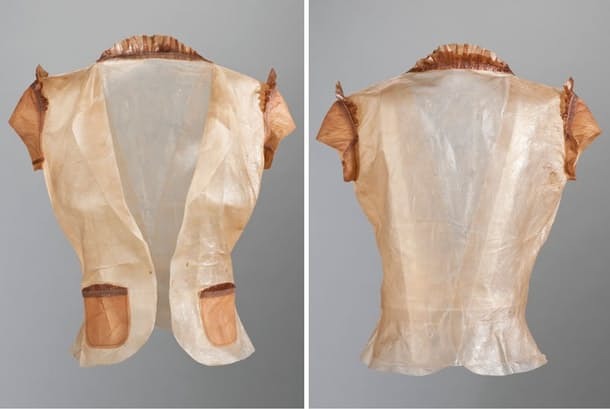 The bacterial flaps by MIT sown into a garment. So, in conclusion, I will state that bio fashion, more specifically; bacterial fashion, is the future of all fashion. The production level of garments is higher than ever due to the speed in which trends nowadays come and go. At the same time, the earth’s resources are being drained and it’s surfaces polluted, human population is rising and life expectancy is increasing. As you can hopefully see, this is not a durable combination and something has to change in the way we produce and consume. Thus, we have to slow down the unsustainable rhythm of fast fashion that we are in and we can do that with the help of microorganisms, now.